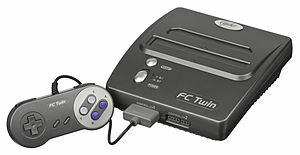 The FC Twin (also known as the FC X2) is a Famiclone that can play Nintendo Entertainment System and Super NES games. Manufactured by Qishenglong (奇胜隆), the system has been well-received due to the increasing scarcity of the original hardware. It is distributed by Yobo Gameware in the U.S. and Gametech in Japan. Similar remakes exist, both by Qi Sheng and others, such as the FC 3 Plus, RetroN 3, Retro Duo, Gen-X Dual Station, GN Twin, etc. The FC Twin uses a card edge connector rather than a ZIF connector and has separate circuitry and cartridge slots for the NES and SNES. With the Super Game Boy adaptor, Game Boy cartridges can also be used. It features a single-pole, double-throw power switch with open position; the switch can be thrown to 8-Bit (NES) or 16-Bit (SNES), or set to off. Second-generation NESes also used a card edge connector and featured no 10NES lock-out chip; however, unlike the top-loading NES 2, the FC Twin is completely compatible with the Galoob Game Genie without the use of an adapter. Both the official NES 2 and the FC Twin capitalize on the card slot reader's greater reliability; games rarely suffer from bad connections as they did with the original ZIF socket. The FC Twin console uses SNES compatible controllers and devices such as the Super Scope, Konami Justifier and the SNES mouse, but cannot use NES compatible controllers and devices. Qi Sheng has its own version of the NES Zapper which is compatible with games that require use of the NES Zapper. The Super NES controller buttons otherwise map to the NES controller inputs (B maps to Y, A maps to B. A maps to turbo B, X maps to turbo A; L and R serve no function). When using any controllers besides the actual FC Twin ones, A and X do not have these added turbo features. Like the original Super NES, Super Famicom games require the removal of two plastic tabs around the cartridge slot in order to be inserted properly. The FC Twin connects through an RCA connector, and can be hooked into a surround sound system. When using stereo and surround output from these systems, NES games may sound very different. At times different copies of the same game can behave differently in the FC Twin. This may be explained by a malfunction with the cartridge itself. Some copies of Dragon Warrior or Super Mario Bros. 2 for example will not work in the FC Twin; while other copies of the same games will operate in the same machine. In other cases, the system simply does not function with certain expansion chips, such as those in Castlevania III: Dracula's Curse. However, the problem with Castlevania III can be corrected on some models of the FC Twin by adding a 7404 inverter or 7400 NAND Gate to modify an A13 signal from the cartridge slot. This may enable other games to work as well. Gyromite US Yes Requires unsupported peripheral (R.O.B.). Possible to play using both control pads instead of R.O.B. Kirby Super Star US Yes Game uses Nintendo SA-1 chip. The FC Twin does not always produce sounds faithfully, even with mono output; sound effects in the Super Mario Bros. series games for example will immediately seem different. Nevertheless, some later models of the console produce NES sound much more faithfully than earlier units. Graphics can appear darker in SNES games and color saturation is stronger for the NES. Graphics are also found to be overly sharp in NES games, particularly with text, as Ars Technica noted in their study. ^ "Yobo Fc3 Plus: NES, SNES and Genesis Games in One Console". Technabob. ^ "Retro Duo Console," GameInformer 180 (April 2008): 34. ^ a b c d e f g h i j k l m n o p q r s t u v w x y z aa ab ac ad ae af ag ah ai aj ak al am an ao ap aq ar as at au av aw ax ay az ba bb bc bd be bf bg bh bi bj bk bl bm bn bo bp bq br bs bt bu bv bw bx by bz ca cb cc cd ce cf cg ch ci cj ck cl cm cn co cp cq cr cs ct cu cv cw cx cy cz da db dc dd de df dg dh di dj dk dl dm dn do dp dq dr ds dt du dv dw dx dy dz ea eb ec ed ee ef eg eh ei ej "8-Bit Alucard's Classic Games". Archived from the original on 2013-02-09. Retrieved 2012-11-28. ^ Kuchera, Ben (2007-02-14). "An NES, two clones, and the Virtual Console. Where does Mario look his best?". Ars Technica. Retrieved 2011-09-11. VideoGameCentral Presents:The Gamer's Voice: New System for the Super Nintendo. This page was last edited on 20 January 2019, at 07:03 (UTC).